Teach resourcefulness (processing information intellectually and emotionally) by applying problem-solving knowledge to new situations and helping students know when to collaborate or work independently. How do students learn to use knowledge to achieve goals? Unless information is processed, organized, and applied, knowledge can become a source of frustration rather than fulfillment. Children learn to use and apply knowledge as they gain skills in planning, organizing, decision making, and problem solving. Together, these skills are the building blocks of resourcefulness -- the ability to find and use available resources to achieve goals. When students imagine multiple outcomes, set objectives, experiment with new approaches, and negotiate challenges, they make important connections between knowledge and goal achievement. They become conscientious creators of their own futures. High grades and test scores are not reliable indicators of resourcefulness. In fact, most teachers know bright college graduates who struggle to resolve everyday problems. Being resourceful takes more than cognitive skill. It takes the ability to process information emotionally as well as intellectually. Research shows that resourceful students are not only better at achieving their goals, but also respond better under stress. One study showed that academic stress adversely impacted the grades of students who were low in resourcefulness, but had no impact on the grades of highly resourceful students. In recent years, we've come to recognize the set of brain processes that help children achieve their goals as executive functioning skills. Housed in the frontal lobes, they help students plan, start, oversee, and finish tasks big and small. These same skills enable students to chart fulfilling courses through life. When these abilities are weak, everyday living can feel like being on a ship without a rudder. Resourcefulness is part of The Compass Advantage™ (a model designed for engaging families, schools, and communities in the principles of positive youth development) because the ability to determine and shape our futures contributes to lifelong happiness and success. 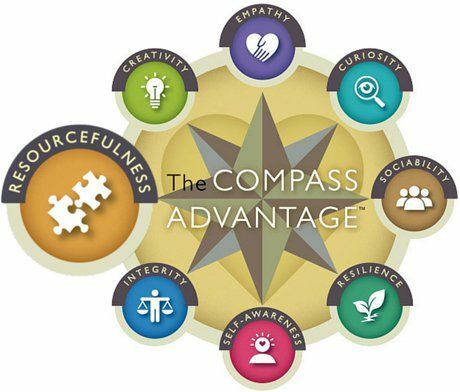 Linked by research to each of the other Compass abilities -- especially sociability, resilience, creativity, and self-awareness -- resourcefulness is one of the 8 Pathways to Every Student's Success. There is abundant information available to help teachers increase children's executive functioning skills. The Center on the Developing Child at Harvard University has a free guide, Enhancing and Practicing Executive Function Skills with Children from Infancy to Adolescence. To take a deeper dive into the topic, I recommend Dr. Christopher Kaufman's excellent book, Executive Function in the Classroom: Practical Strategies for Improving Performance and Enhancing Skills for All Students. Executive functioning skills play a primary role in how students learn to self-regulate, directing their day-to-day and long-term actions. But it is also important to teach the broader concept of how to become a resourceful individual and why this matters in life. Students learn resourcefulness through the practice of being goal directed. Teachers provide environments that foster resourcefulness when they encourage students to plan, strategize, prioritize, set goals, seek resources, and monitor their progress. In the words of Tony Robbins, "Success is not about your resources. It's about how resourceful you are with what you have." One of the best ways for students to understand resourcefulness is through the stories of resourceful people. What they learn from the biographies of people like Temple Grandin, Richard Branson, and Walt Disney is that all types of learners can be resourceful. Their commonalities include being able to see beyond everyday solutions, not giving up when problems get complicated, and learning from mistakes along the way. Ask students to analyze stories of resourceful people. What did they do? Why? How did they accomplish their goals? 2. Apply knowledge of problem solving to new situations. In A Five-Step Problem-Solving Process, A.C. Burris adds a fifth and important step to the list: extend the problem. This gives students practice in generalizing and applying what they've learned in a variety of contexts. Teachers should look for opportunities to connect the principles of problem solving in a variety of subject areas and real-world experiences. This fifth step helps students connect resourcefulness to all aspects of life. 3. Encourage the use of technology. There is an abundance of technology to help students become more resourceful and productive. For example, mind mapping can help kids better understand problems and devise plans by visualizing connections, outlining different sides of issues, and determining next steps. Electronic planners, note-taking programs, and timeline software can help students carry their plans to completion. 4. Help students reflect on their problem-solving processes. To reinforce the fourth principle in Polya's approach to problem solving, help students understand what it means to look back. Teach kids to review their thinking processes. What would they do differently next time? Strategies for improving reflective skills can be found in Metacognition: Nurturing Self-Awareness in the Classroom. 5. Promote independence and collaboration. While independence and collaboration may seem like opposites, both are necessary to become resourceful. Students should be able to decide which tasks are best accomplished alone and which benefit from teamwork. Before beginning a class project, ask students which tasks should be done by whom? Why? How might collaboration help or hinder the project's outcome? When students take part in planning classroom projects, often done by teachers, they see firsthand what produces good outcomes. When the project is complete, ask students to evaluate what went well and what could have been done differently to improve the end result. 6. Teach students the art of positive skepticism. Being resourceful means developing the ability to look at multiple solutions to a single problem. It also requires a dose of skepticism. When we teach kids to be skeptics -- to require additional evidence before accepting someone's claim as true -- we also teach them to be resourceful problem solvers. 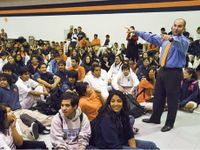 Teachers can model positive skepticism in the classroom, teaching students to think like Galileo and Steve Jobs. One of the values of flipped classrooms is a teacher's ability to provide differentiated instruction and encourage students to work at their own pace. Instead of associating planning, organizing, and problem solving mostly with homework, teachers can observe those processes in the classroom. This allows them to see when students hit roadblocks that get in the way of accomplishing goals. Proper guidance and support can foster students' ability to learn from their planning and organizational challenges. See Flip Your Classroom: Reach Every Student in Every Class Every Day by Jonathan Bergmann and Aaron Sams. And please tell us in the comments below how you encourage resourcefulness among your students.